Ever since the film Saving Private Ryan, the image of soldiers approaching a heavily fortified beach in landing craft is etched into popular culture. Every WW2 video game usually includes some version of that famous sequence. 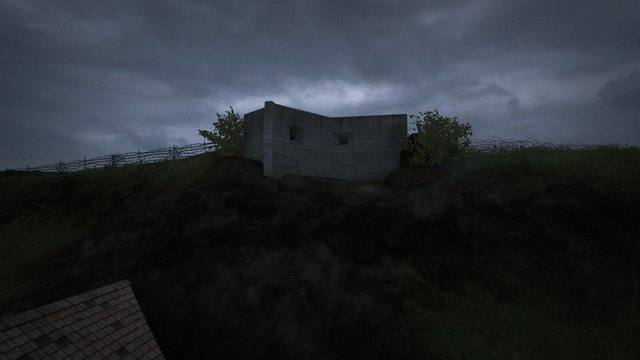 The cold steel obstacles and towering concrete bunkers serve as a handy visual metaphor for struggle against overwhelming odds. However, while SPR is certainly a fine movie, its depiction of the Omaha Beach defenses is also marred by several inaccuracies. 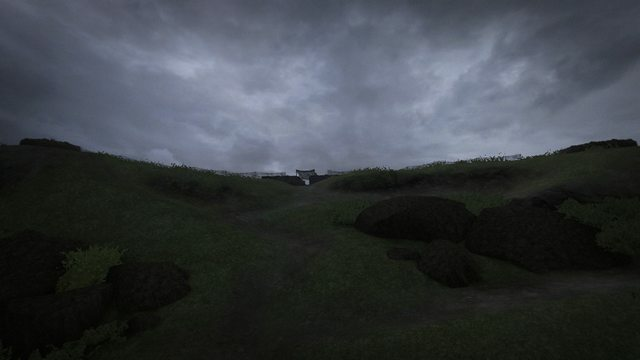 Forgotten Hope 2 has always prided itself in providing a more historical experience than the average mainstream game and so our version of the defenses around Dog Green and Charlie sectors are close to 100% accurate. Let's look at them, shall we? It is tempting to think of the Atlantikwall as some kind of impenetrable fortress, consisting of continuous lines of trenches and bunkers. In reality, the Germans had neither the manpower nor the ressources to build or man such a line. Instead, they build a series of Widerstandsneste (eng: strongpoints, lit: nests of resistance), small clusters of fortifications concentrated around important weak points in the line. One such point was at the village of Vierville-Sur-Mer. As you can see on the map, a road cuts through the coastal cliffs here, leading inland. If the Allies wanted to move supplies from the beach, they would have to control this road, which was designated D-1 Draw by the Americans. The Germans defended it with three WNs: WN70, WN71 and WN72. You can see the three flags on the minimap. Right away you will notice that this doesn't quite look like the huge SPR MG bunkers. The reason for this is simple: If you sight a bunker to aim out into the sea, it is vulnerable to the heavy artillery typically carried by warships. Its lines of sight are also limited to what's directly in front of it. 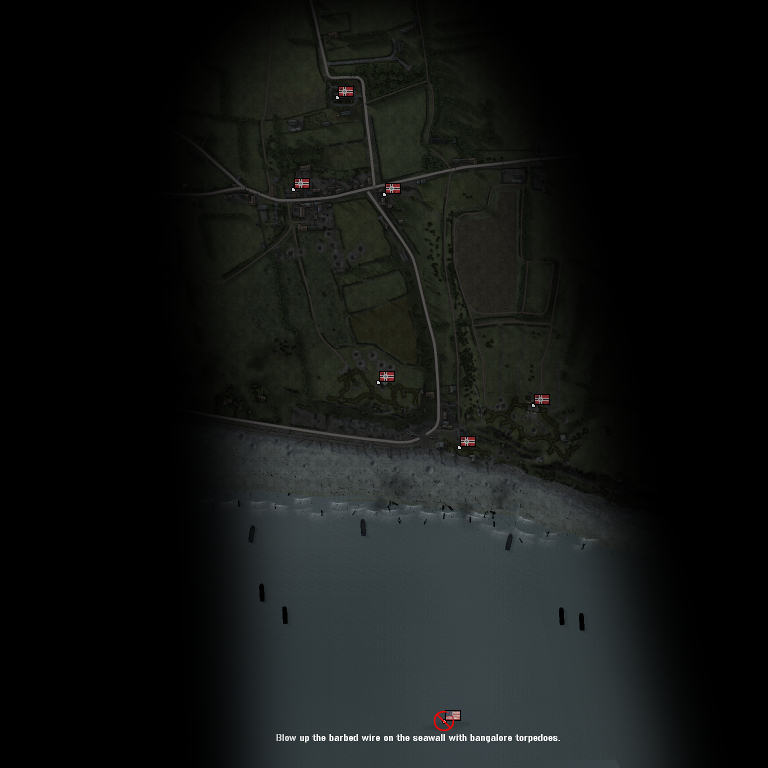 This bunker is instead sighted to aim down the length of the road, as well as the beach. This means a wieder field of fire and exposed flanks of any tank attempting to drive up the beach. You may also notice that it is separated from the beach by a big concrete wall. This is a so called "defilade wall" and designed to protect the 8.8cm Pak43/41 inside against naval artillery. Since this gun is not yet available in FH2, we will use a 7.5cm Pak40 as a placeholder. 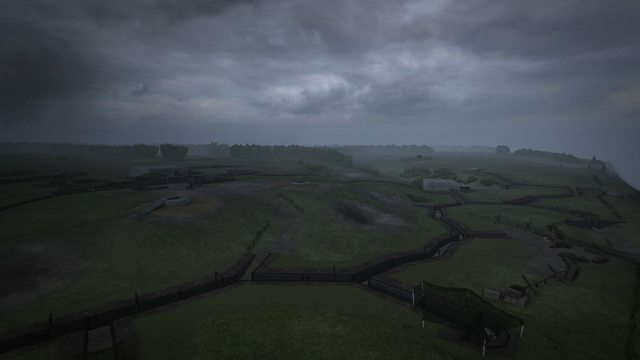 The various bunkers in all strongpoints are connected by trenches, allowing German infantry to change position without sacrificing protection. You can also see another nice detail: The Germans tried to camouflage their bunker as a restaurant with a deck in front of it. 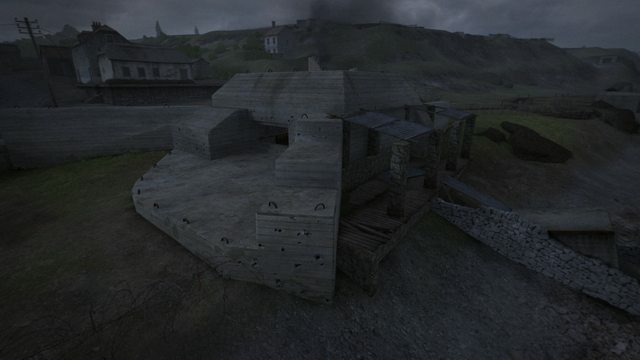 Of course, the initial bombardement destroyed this flimsy construction and only left the bunker intact. Still, the back of the bunker is somewhat of a blind zone, which is why the Germans constructed their defenses in a way that let the different bunkers cover each others blind zones. In SPR, the main goal of the heroes is to reach the shingle or beachwall in the opening sequence. Once there, they are in relative safety, since the machine guns can not shoot low enough. As you can see, that safety is a mere illusion in reality. The bunker above is a so called Doppelschartenbunker (eng: double embrasure bunker) and is build directly into the seawall. It also doesn't shoot out into the sea, but houses a 5cm gun that enfilades the shingle on both sides, securing it against tank attack. To defend the back of the bunker, the Germans installed the turret of an obsolete French H39 Hotchkiss tank on this bunker as well. Note how a defilade wall protects it against naval strike. 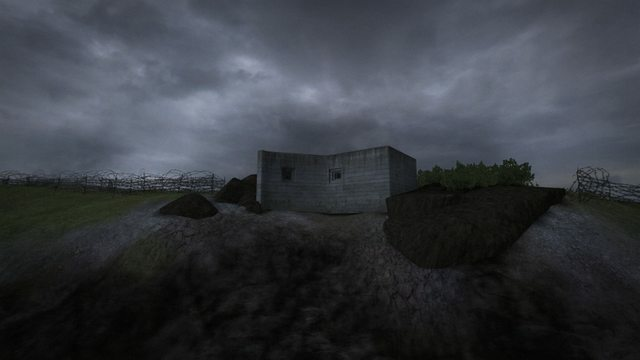 Ingame Germans will be able to enter it through a steel door down in the bunker. 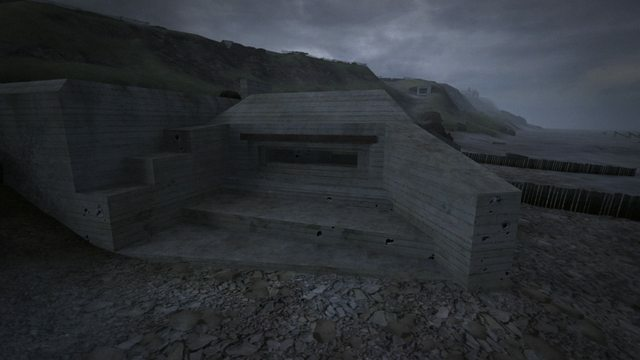 It can be taken out by direct fire like any tank or by placing explosives against the bunker door. WN71 is flanked by additional strong points up on the cliffs on both sides of the draw. Their main objective is barricading the road leading inland. For this purpose, two machinegun bunkers are build into the cliffs on both sides of the road, creating a deadly crossfire. These positions are connected to their troop bunkers by extensive trench systems that also include mortar positions and camouflaged machine gun nests build into the bluff. These MGs are aimed directly at the water line, but they are vulnerable to artillery fire and have big blind zones under them. 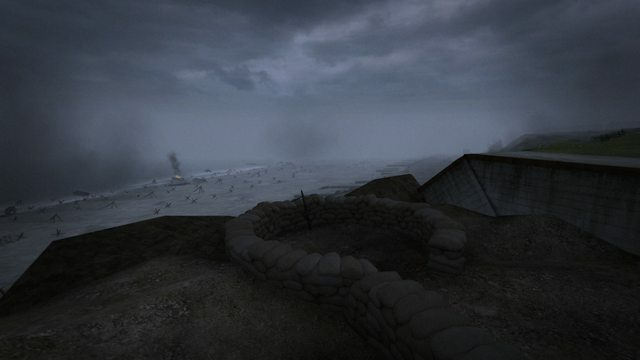 Once the Americans have gained a foothold on the beach, the German defenders will only be able to spawn in the WNs on top of the cliffs, making it harder to keep the bunkers manned and operational. On top of that, almost all German MGs are emplaced in bunkers or nests, so they lack mobile firepower and have to rely on machine pistols and the occasional automatic rifle to defend their trenches against the attackers. The Americans will have to fight their way up the hills using several small footpaths leading into the defensive system. Once inside, grenades and automatic weapons will hopefully win the day for them. The last position we will look at is this 5cm anti tank gun bunker in WN72. This illustrates the principle of defense quite perfectly. The gun is protected against fire from the sea and covers the blind spots of the WN71 bunkers. At the same time it is in turn covered by the tank turret. American players will have to learn how to unravel these carefully laid out defenses if they want to succeed on this map. 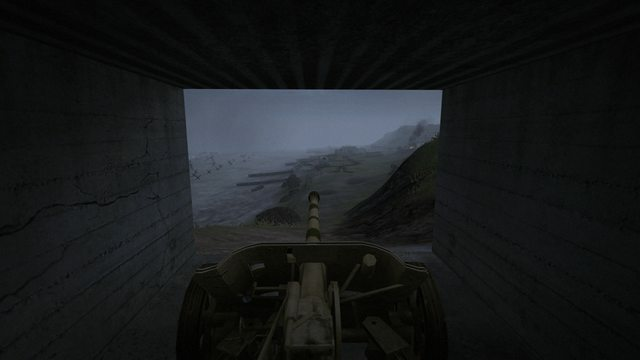 Looks like the Allies will need some real teamwork to get off the beach, but at the same time the Germans will have to make sure to keep their bunkers manned with troops and guns repaired in order to keep the Allies from pushing them out! Looks very well planned and realistic! Great job. Oh, and I wonder if there is the rest of that French tank, or even more? Time for Tankbuster and his smoke grenades to shine. Thanks Ts4Ever, I am sure we are all going to get excited for this upcoming release. Great, thank you! This will be great fun and a different kind of challenge for each team and therefore going to be really interesting. Looks like there is a lot of detail and research behind this to achieve historical accuracy, which is what I especially like. Would be cool if they did. They've already got the turret and the tracks. 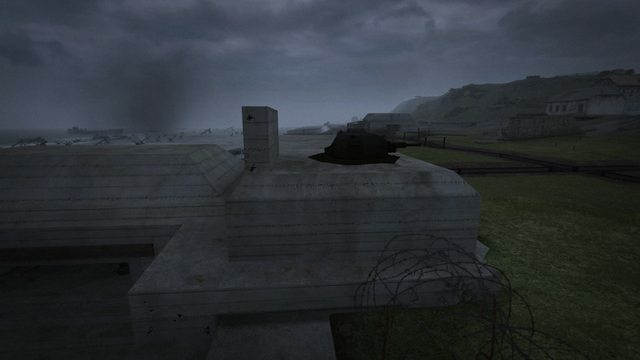 Would be fun to have some rockets on it and blast away at the enemy with my little sneaky tank. Is there ammo & mortar on the beach for the Allies? 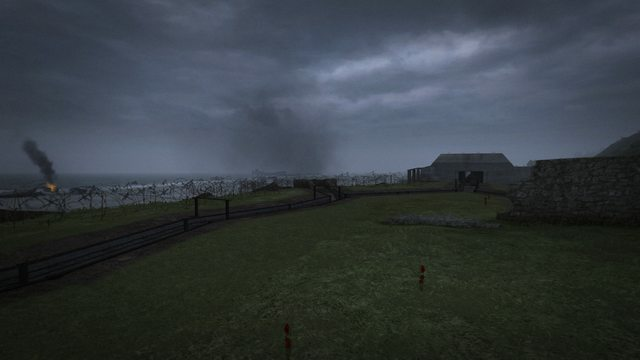 Btw, I realised that the Omaha Beach minimap shows the beach at north while in reality it is at southwest.